Find out about handbag color trends in this hot new interview with Leatrice Eiseman, Executive Director of the Pantone Color Institute. Pantone, known as a global color authority, helps the fashion design industry by releasing the PANTONE VIEW Colour Planner every 24 months. It forecasts color trends in women's fashion for upcoming seasons. This can help handbag designers create purses that match the colors of each season and have those bags on the market in a timely manner. The PANTONE SMART Color Swatch Card System is used by designers during the "color development cycle". The system helps to reduce production costs and increase the speed with which products arrive on the market. The Pantone Color Institute takes things a step further by offering custom services to those in the fashion industry as well as many other industries by conducting research. For example, the website indicates that a handbag designer could learn "how color influences human thought processes, emotions and physical reactions". Leatrice Eiseman spoke with us about the exciting work she does at Pantone in regards to fashion and shared some inside tips about what we can expect to see in upcoming handbag colors. Leatrice Eiseman has authored several books on color, including Color: Messages and Meaning, which talks about color psychology. Her book More Alive with Color is meant to help people achieve a sense of personal style through the use of color. Ms. Eiseman has studied at Antioch and UCLA, has studied and taught fashion and design, and is a world renowned color expert. 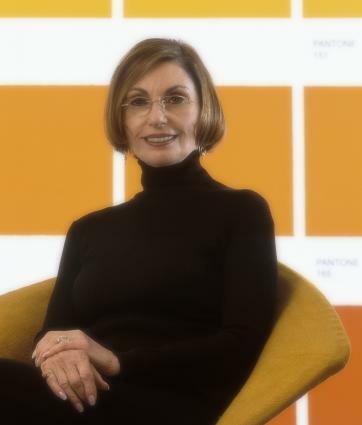 She writes a blog about color called Eiseman Color Blog and serves as Executive Director of the Pantone Color Institute. LoveToKnow (LTK): Tell us, Leatrice, when you were a little girl, did you enjoy wearing a wide variety of colors? Leatrice Eiseman (LE): Yes, I was the proverbial "kid in a candy store" when it came to colors. I had one of each! LTK: What is your own personal favorite color? LE: It varies, but right now it is periwinkle and different purples. LTK: You have a wide educational background, having studied everything from psychology to fashion and design. How do you think this has helped you with your work as a color specialist? LE: No question that all of the above have influenced my thinking. Everyone has emotional ties to color, so I would say psychology is very important. The design aspect generally comes naturally, although I do believe there is a lot that can be learned about color. I think people have more inherent feelings about color than they realize and in my classes and books I show them how to unlock their color potential. LTK: You have some pretty impressive clients on your list. You've worked with 3M, Microsoft and Walmart. Is it challenging to work with so many different types of businesses? LE: It is a challenge and that is what I love about it! There are many aspects of choosing colors for various products or surroundings and they take research, time, effort and expertise. I always tell the attendees in my classes that they need to look at the big picture for color, as influences can come from diverse resources. LTK: You wrote a book called More Alive with Color. How can women communicate with the color of their handbags? LE: More Alive with Color is about color, fashion and self-image. Every color delivers a message and is connected with nature. LTK: What about a woman who likes a plain black or brown leather purse? Any ideas for adding color in simple ways to still make a statement, but stick with that basic purse? LE: I think bags can accessorize an outfit and also be accessorized. I love using vintage pins as accents or an earring that has lost its mate. You can also do something that haute designers have done for years and tie a fabulous scarf onto the handle. Even a really long necklace (again vintage is fun) can replace a plain leather strap. LTK: Can you tell us a little about your Color Clock system? LE: The Color Clock system is built around how colors can imitate palettes that are found in nature at specific times of day. For example, a Sunrise palette has some of the cooler, clearer colors of early daytime - think daybreak that then blossoms into a sunrise. A perfect color for someone who has cooler coloring would be in the blue family. At the opposite extreme are the Sunset colors - think of that time of day and some of those tawny, honeyed shades for people with warmer coloring. A great bag for a Sunset would be in the golden camel or tan tones. In the midday, when the sun is the strongest and creates a 'sun-drenched' effect, colors need to be a bit more subtle as this Sunlight person needs more muted tones. Bright orange would be overwhelming for this person, but something the shade of peaches and cream would be perfect. LTK: You regularly release a PANTONE Fashion Color Report. The spring report looks very interesting. What are some of the colors women should try to utilize this year in their handbags? LE: I am a handbag collector as I think that they are the perfect way to use color as a statement. You might not choose to wear a bright chartreuse dress, but a bag in that color is dynamite and can do so much to "lift" a dark or neutral outfit and give it some excitement. I would suggest any of the more vibrant trend colors in the report such as PANTONE 18-2120 Honeysuckle or PANTONE 15-4825 Blue Curacao as most people already own a bag in black and/or something neutral. Spring is about color. LTK: Who do you consult to come up with the trendiest colors? LE: For the Fashion Color Report, the designers are surveyed to find out what colors they plan on using in a specific collection, and then we do an overview to see what colors are the most prevalent. That is the information we incorporate into the reports. LTK: How do Pantone's color fashion reports help designers? LE: Pantone does reports that are actually forecasts. This is what designers look to well ahead of committing to a collection so that they can derive the benefit of seeing what our predictions are for future. For fashion and other related products, it is the PANTONE VIEW Colour Planner. LTK: What is your advice for a woman who feels she has a signature color and never wants to deviate from it? How can these women still have that favorite color in their handbags and be trendy at the same time? LE: In my book More Alive With Color, I explain signature colors and do feel that they can provide a good background for the entire wardrobe. A Sunset person with copper colored hair, amber brown eyes and warm skin knows that she can always rely on those tawny shades to blend with her coloring and work with many other warm shades that will be good on her. But there should always be room for an element of surprise and something that will add some drama. In that same Sunset palette, there is a gorgeous deep peacock blue that is a perfect accent to the other golden toned shades. If peacock is a trend color for the season, all the better. I immediately think of a patterned bag, like a paisley that contains all of those hues and how really striking that would be. The beauty of it is that a print contains a variety of colors, so there is something that will probably work for another season's trend colors. LTK: Okay, I have to know, what kind and color of purse are you carrying right now? LE: I am wearing various mossy greens in my outfit and my bag is a deep wine felted wool with small decorative raised dots of yellow-green, teal and taupe. LTK: Any advice on what color handbags go best with different shades of clothing? LE: That is really a big question and one that can't be described in just a few words, especially since I think it limits people to think only in terms of rigid rules. I encourage people to exercise their own creativity as that is the real fun of handbags. There are so many colors and so many variables. Still, if they understand their Colortimes (Sunset, Sunrise, Sunlight), they will find what will work well for basics. There is a group of colors called Crossovers that are frequently found in nature. These colors are versatile enough to work with many other colors. Among them are of course black, taupe and sand, but also wine and aubergine (eggplant). LE: I love handbags and have quite a collection. I always know that when I shop or travel it is one of the first things I look at and it will probably come home with me! A very warm thank you to Leatrice Eiseman for sharing her expertise about color, fashion trends and how to pull it all together. Her advice will no doubt help readers pull together the perfect handbag look to match their current wardrobes. Remember that she advises to be a little daring and to use your own creativity with color as well.